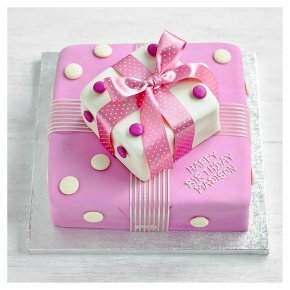 A two tier pink parcel cake. The bottom tier has an 8" square golden sponge base covered in pink sugar paste, decorated with white chocolate buttons and the option of a personalised message in royal icing. The top layer has a 4" square golden sponge base covered in white chocolate flavoured sugar paste and decorated with pink milk chocolate beans.